Almost all Windows 8 tablets include a special slot for sliding in a tiny memory card. They’re much like the cards that people slide into digital cameras and cellphones every day. The slots and cards are so tiny, in fact, that you should buy a large-capacity card, push it into your tablet’s slot, and leave it there. Most Windows 8 tablets can use three types of cards. 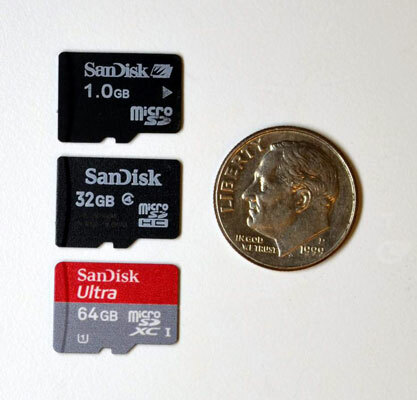 The microSDHC cards can hold up to 32GB, whereas the newer microSDXC cards come in capacities of 64GB, with higher capacity SDXC cards on the way. For best results, buy the largest capacity card your tablet can use. Insert it into your tablet, and use it as a backup space with Windows 8’s new FileHistory backups. FileHistory makes your backups both automatic and easy to access.